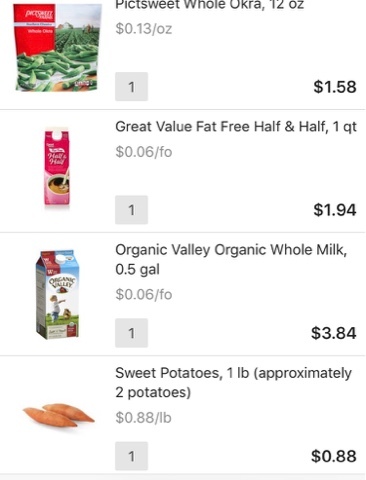 I had a lot of you ask about my goal of a $100/week grocery store budget for our family. Guys, it's doable. I promise! This shopping typically carries us through the work week -- on the weekends we like to order a pizza or Chinese, and we'll often hit the grocery for a Sunday night dinner like hotdogs or grilled steaks). So that is one reason why I'm able to stick to this budget. 2) You'll need to think about what items can serve double-duty. For example, grilled chicken one night? Buy a more economical family pack of chicken, and grill enough to put a few pieces aside. They can be sliced and put in a tupperware, and you've got your salad topping for a future lunch or dinner. 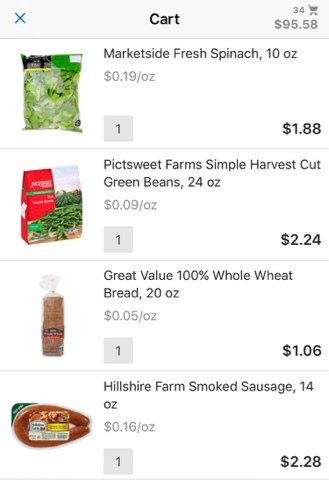 3) If you really want to budget on a WEEKLY scale and not a MONTHLY scale for your groceries, then there may be some items that you won't buy in bulk any longer. Let's say, for example, diapers. If you buy the big boxes that are $30-35, there goes your budget. But if you hold yourself to the smaller packs that are $8.97 at Walmart, then you can spend more of your weekly allowance on other items. The price per diaper will go up, so it's technically less economical, but you're focusing here on how you can grocery shop here on a weekly $100 budget. Same goes for paper towels. It's cheaper to buy the 12-pack. But, for you're budget's sake, you may just want to buy one or two single rolls. 4) Shop for your groceries online, EVEN if your store doesn't offer the service. 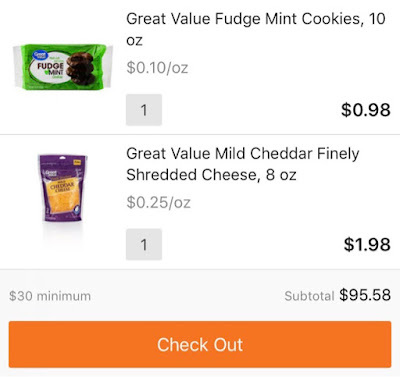 Use the online shopping at least as a grocery list builder. So, say you live in a place that doesn't offer the Walmart grocery service. Well, you can put in a zip code that does (use one here in NC - 28210) and then create your list online using REAL prices, well at least for the zip code you enter. That way you can see how it all totals up before you go to the store. There's a much better chance you'll stay to your $100 goal that way. 5) I'm going to show you below a Walmart grocery list that's $95.58. Walmart doesn't have the same BOGO sales that my local grocery store does. But I chose Walmart because grocery stores are so localized and geographically-based. No matter what state you're in right now reading this blog, you probably have a Walmart nearby. But if you're shopping at a grocery store, build your list around items that are on BOGO (if and only if one item rings up half-price and you don't actually have to buy two) or items that are on major sale. Like, are grapes usually around $4/lb where you live? When they go down to $0.99/lb, that is the week that you have grapes at home. Alright. Weekly staples in our home ... let's go! With the few dollars extra that I have allocated, this is where you can plug in one or two more favorites. Maybe its some fresh berries, an avocado (which is another amazing toddler meal item), tortillas (great for wraps or cheese quesadillas), carrot/celery sticks, ziploc baggies, new sponges. 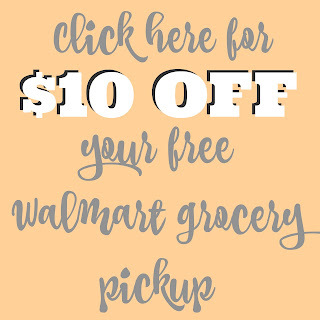 Remember that using my Walmart Grocery referral code (HERE) earns us both $10 towards our groceries if you are a new customer! The service is SO easy to use and their customer service has been surprisingly awesome. I'd love to hear your thoughts on this list ... are there any glaring omissions? Do you think you could stick to a budget like this? This is so interesting. I do HT express lane and use Amazon Subscribe and Save (for things like diapers, paper towels, and snacks like Cheez-its). did you stop going to Aldi? 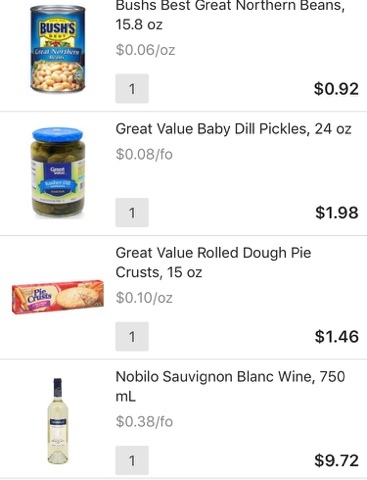 I'm #teamaldi for life :) I still go there and it's pretty easy for me to stay under $100 even without carrying around a calculator, ha! 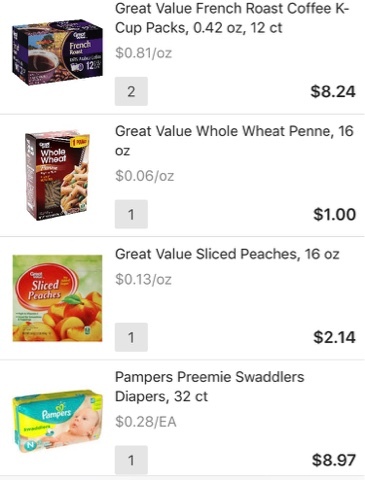 I used to always do my diapers/wipes from Subscribe and Save on Amazon, but found that I wasn't logging in regularly to hold off on items I no longer need. For example, Camille only does a small pack of pull-ups from time to time, but recently I received a huge box of size 4 diapers. Whoops! At least Charlotte will grow into them! I'm totally obsessed with Walmart Grocery Pickup! (And totally picked up a bottle of Nobilo Sav Blanc with my order, too, yesterday!) I have saved SO much money using this service as opposed to shopping in-store at Kroger. Not only are the prices lower, I'm not distracted by the ancillary stuff. Plus, not having to drag my two boys into a store?! Yes, please! Bingo bingo bingo on allllll of this! Plus, I'm so obsessed with having the total to land around $100 that it allows me to make the last-minute tweaks. So if I end up at $107, I'm like ... what gets omitted or exchanged for something similar but less expensive? Thank you for this post! I try to stick to $125/week (and I rarely ever go over budget), and your tips are great. It's so refreshing to see a post like this (as opposed to the latest vacation or new $500 purse that certain other bloggers write about!). You are so normal and relatable. Keep up the good work! Also - does this sample shopping list include lunch for your husband on work days too? Or does he do his own thing? That's something we struggle with. Aw, thank you! I think $125/week is great. If we did Fri/Sat/Sun night dinners at home, I'd need to bump ours up a bit too. Add in a frozen pizza for $6, some enchilada ingredients, et cetera. So, Ian works in the hospitals and leaves so early in the morning so he does not pack a lunch. He gets a discount on hospital food so eats really cheaply on his own. Amen! This blog is one of the few I can actually relate to and look forward to reading . It is so refreshing to not have a pile of rstyle links all the time and see someone who has a budget and sticks to it! I usually really love these types of grocery shopping posts and it's a great encouragement to use pickup services as a way of budgeting, but I've got to be honest... the first thing to go when we were looking hard at our food budget was takeout and eating out. That might happen once every other month or so. Personal choices so no shame/blame... it's just a bit of a misnomer to say $100/wk + takeout + eating out + an extra grocery trip for weekend dinner. My goal is $135 for 7 days not including diapers/paper products. It could be where we live too but there is no delivery here and none of the takeout options lean towards healthy, so it's not even convenient, affordable or healthy. I LOVE a good Asian takeout as a splurge! Growing up we had that weekly in my house. The tips on buying bulk family packs and looking for sales are helpful and I'm glad that you share your real life with us as always! I'm sorry you feel it was a misnomer! I definitely think there is a difference between me saying "$100 a week on groceries" and "feeding our family for $100/week." By no means do we spend $100 in seven days on all of our family's food plus household supplies. I use the $100 grocery store goal to get us through the work week. On the weekends we LOVE to be spontaneous, so I don't have those meals planned during my weekly store trips. We often decide at the last minute what we want to do as a family, whether it's eat out or grill something together in the backyard. Or -- my fave, takeout/delivery! :) No toddler tantrums in a restaurant and no cleanup! Sarah, I agree. I think a better title for this post would be "my grocery budgeting approach" as opposed to $100/week for groceries. I'm also surprised at the advice to buy small quantities weekly, even if it's more expensive per item. If you watch your grocery store's sales cycle, you might stock up on a rotating basis, so that 1/3-1/2 your spend each week is allocated to a different category of "stocking up." For example, when greek yogurts are on sale 12-for-10, I buy a 4-week supply; when soups are 10-for-10, we'll often buy 20 of them, when Coke Zero is 4-for-12, we buy 12 cases, etc. The overall spend stays pretty consistent week to week, it's just a question of what's worthy of stockpiling! What do ya'll do on Friday, Saturday and Sunday? Maybe ya'll are having leftovers? We spend roughly $100/week on groceries and we rarely eat out and usually have a lot of leftovers. I shop Costco and Aldi. LIke these next 2 weeks, we are eating the leftovers in the freezer instead of buying more food. Hey Crystal! We are totally spontaneous on the weekends and we don't plan for those days in our weekly grocery plan. Sometimes I just feed the girls, put them to bed, and Ian and I order pizza! Sometimes we meet up with another family and cook out together. Last weekend I swung by the store and got deli roast beef, french onion soup, provolone cheese and 2 Italian rolls and we made the easy French Dips I've blogged about before. So it varies! Depending on the week I spend around $100-$150 on groceries each week for two people. This includes all breakfasts, lunches, and dinners for all seven days a week. We hardly ever go out and if we do it's usually just for lunch because it's cheaper than going out for dinner. I try to get as much as I can from Trader Joe's because I found it's the cheapest (Aldi is too far away) and then swing by Publix on the way home for whatever else I need. I do splurge on organic meats because I really can taste the difference. I like the idea of ordering groceries online but I try to buy as many raw (vs. packaged) foods as possible and I feel like I need to pick those out myself. Have you tried the frozen chicken tenderloins from Trader Joe's? They are not organic but MAN they are delicious. They taste so ... chicken-y. :) I love getting a big bag of those from time to time and then just thawing out what I need! I am always amazed by how much money we spend on groceries. I love your $100/week challenge, and it's inspired me to definitely take a closer look at ours. Great post! Gracias my friend! No matter what the dollar amount is, just having a budget that you work towards is really helpful! I love this post and find it so helpful! 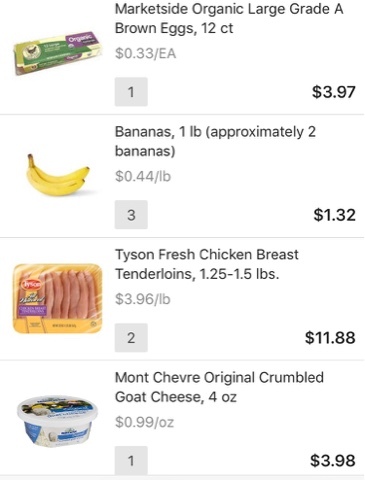 I live in rural northern Maine, so while we do have a Walmart, we do not have delivery/pick-up as an option. It's a great idea to put in a different area code just to keep track of the expense though!! We generally try to stick to $150 a week for our family (2 adults, 2 small children.....plus, I'm pregnant with number 3 so I probably eat more than 1 adult..lol) and that includes all meals for all 7 days, plus household/pantry items such as diapers, toiletries, garbage bags, dish soap, etc. We aren't always successful with the budget, but are typically right around the $150 mark. I tend to buy meats, fresh produce, and deli items at our local grocery store and then everything else at Walmart. Wish we had an Aldi!!!! Yes! I bet Aldi may make its way to you at some point. You'd LOVE it ... especilly for their baby products! The $0.79 organic pouches are the best! LOVE LOVE seeing posts like this. I dont even have children and I want to try this Walmart pick up! Thanks for sharing! It's a timesaver and money saver for everyone ... whether you have kids or not! We used to have a Sams membership and sometimes I wonder if we should get it back, or Costco. I used to love getting our Keurig coffee pods there! we think costco is worth it purely for the trash bags, dish detergent, spongers, laundry detergent, paper towels, toliet paper, etc. i also stock up on snacks when we go to the lake, etc. and they always have the best flowers (like 2 dozen roses for $16.99). We roughly spend $80-$100 weekly plus weekend take outs for dinners or breakfasts. So it's pretty similar. Yes, the stockpile ... HA! At one point we had enough paper towels to last us probably a year. Whoops! I NEED to try this! Our grocery bill is out of control! Ours was too, it was just very unorganized with lots of visits each week and no sense of budget whatsover! I love this! I love how you take the time to share how you shop and plan for groceries meals, etc! Your perspective is making me wanna reevaluate what we do. I used to be so good at budgeting and meal planning and lately I've slacked big time and have been going every three days which has been making things so wasteful and SOO overspending. I actually though the idea to buy stuff in smaller quantities (even if a little more) is a good idea. At least when trying to figure out a plan and a budget that works for someone. We use paper towels like they are going out of style and my kids are always needing them for something. Perhaps if we paid more and they were a weekly item, we'd be a little more aware of the waste. We never buy frozen veggies. How do you cook the okra? (Fresh or frozen) if love to try it. Liz, thank you so much! We were also going to the store way too frequently (both myself AND my husband and sometimes we'd wind up with duplicates like 2 gallons of milk). Buying the smaller quantities at least helps me with keeping my fridge streamlined and not having a ton of waste! I meal plan the exact same way! I do Mon-Fri and then leave the weekends as "open" on my menu board. We normally are out and about and either grab takeout or stop and get something fresh and last minute for the grill. I don't know why people are getting upset over your title, sheesh! You go girl! Side note on baby items.. we just had baby #2 and a friend got us a massive 1000 wipes box of SAMs brand wipes and I love them!! Luckily we already had a SAMs card so that's what I use now! Bahaha - ehhh, can't win 'em all I guess. Who knew a post title could be so maddening to some? I still don't see an issue with it. ANYWAY! Congrats on baby #2 and that is the BEST baby gift ever. A thousand wipes! Now that is a gift that will definitely get used! I love this post so much April! 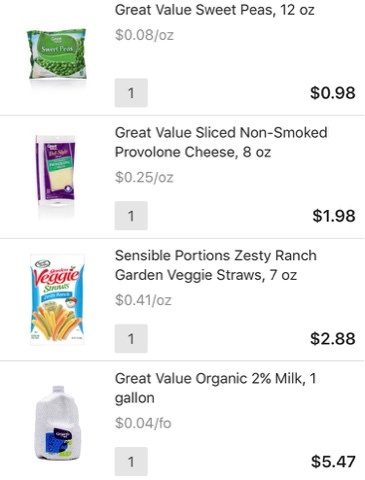 I'm on a very tight budget this year with my new job (and dealing with high rent in New England + trying to pay off school as well) so I've been really trying to watch my grocery spending. My goal is $40 a week on groceries (and $50 if it's a splurge week with a special item, or if I need to restock on some pantry items), and one meal out a week and one coffee/dessert treat out a week too. So far I've been sticking to it, but this post was great motivation!! I always love your recipe posts as well. And shout-out to 28210- my old zip code! All that great value brand good is really unhealthy though which is why our bill goes up quickly each week we calculated 250$ per week one time :( !! YES! This is so helpful and $100 is DEFINITELY doable without feeling like your meals are just ramen packets (but, hey, some days...). 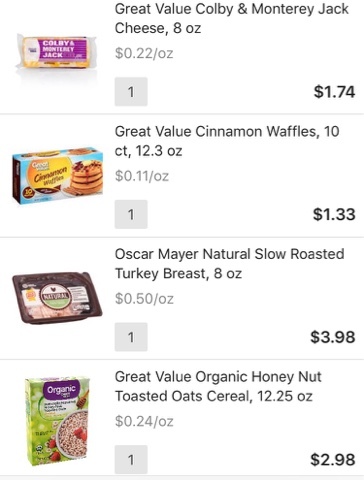 I'm giving Walmart Grocery a go this week for Pots & Plans and can't wait to see how it stacks up!